NOTE: Member plus guest will cost a total of $82. TO ADD YOUR GUEST: click on the "ADD GUEST" button at the bottom of the data collection form and enter the guest information, as indicated. Thank you. Registration Fee includes Van Galder Bus travel w/Wi-Fi. Personal expenses and lunch is on your own. Come join us aboard the PLATO bus on our a la carte holiday tour into downtown Chicago where you may choose among four locations from which to begin your holiday adventure. First stop of the day is in "The Loop" at the famous State Street Macy's (formerly the historic flagship store of Marshall Field's). Enjoy Macy's annual holiday decor. It's not the Christmas season until you've seen Macy's Holiday Windows. For decades, the "windows" have been a holiday tradition. They have a different theme every year, and tell a holiday story. 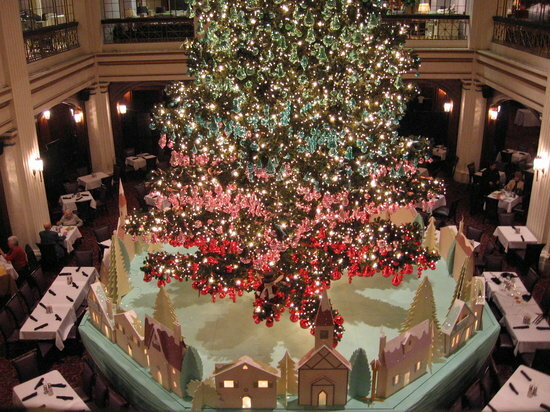 You can see the Windows before the December crowds, and view the great holiday tree, a tradtion of the Walnut Room-- also a great place for lunch. Or, pick from 5 other eateries at Macy's. You'll want to see the entire store which will be decked out in spectacular holiday decor, as no other store. And, of course, you can get a head start on your gift shopping. There's plenty of space under the bus to stow your packages. It's just a short walk to Michigan Avenue and the Chicago Cultural Center, a historical building with 2 stained glass domes, and changing exhibits. Admission is free, and it's worth seeing. Second stop of the day: The Art Institute. The new exhibit is: Moholy-Nagy: Future Present. The first retrospective of Moholy-Nagy in the United States in nearly 50 years traces the career of a multimedia artist who was always ahead of his time. And the always popular Holiday Thorne Rooms: The beloved decorating tradition is back, with an even more extravagant display in the English Drawing Room of the Victorian Period. General admission to the museum is $19 for seniors. Check out the great gift shop and the Institute's new wing. 3 indoor restaurants to choose from for lunch. And just across the street: Millennium Park. You'll want to check it out. Take a "selfie" while looking at "The Bean". Third stop: The Museum Campus. There are three world-class museums located there: The Field Museum, The Shedd Aquarium, and The Adler Planetarium. Take your pick! The Field is featuring a two special exhibitions: China's First Emperor and his Terra Cotta Warriors and the Cyrus Tang House of China. Senior general admission is $19 or $25 if you want to see any 1 of the special exhibits ($30 for All Access ticket). Choose from a bistro or a cafe for lunch. Fourth and final stop: Museum of Science & Industry (our “new” Only-in-November stop) Christmas Around the World and Holidays of Lights. Originally built as the Palace of Fine Arts at the 1893 World's Columbian Exposition, the Museum of Science and Industry is the largest science museum in the Western Hemisphere full of informative and industrial hands-on exhibits. And it is the home of the annual Christmas Around the World display of specially decorated trees, scheduled to be up and lit by November 17, the date of our trip. If nothing else, this will definitely put you in a holiday mood. The Museum’s 45-foot Grand Tree takes center stage in the Rotunda, surrounded by more than 50 smaller trees and displays presenting the cultures and holiday traditions from around the world. Holiday spectacular included in entry fee of $18. Museum Entry does not include special exhibits/events, Omnimax® movies Coal Mine, WOW! Tour or U-505 on-board tours. OR GET OFF AT ANY OF THE FIRST 3 STOPS AND CATCH A DAY OF SIGHT-SEEING ON A CHICAGO TROLLEY.